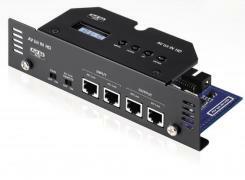 Brand new AV bit IN HD, Digital interface for all AV amplifiers, for perfect digital connection with bit One and bit Ten D audio processors or with any Audison devices provided with AD Link and AC Link connections. It features two new switches on the front panel: one provides you with the ability of turning off the gain control of the amplifier to achieve an improved Signal to Noise ratio that reach 100 dB with Gain Off. With the second switch you can control the DSP remote start function.